Electronic Arts today contacted game writers around the country asking them to return the brass knuckles they were sent as part of a promotion for Godfather II. The representative that contacted me said that the company wanted to make sure that the brass knuckles were "properly disposed of." He declined to comment any further. Contacted by email Friday, an Electronic Arts spokesperson verified that the company is asking that all of the brass knuckles shipped out be returned. 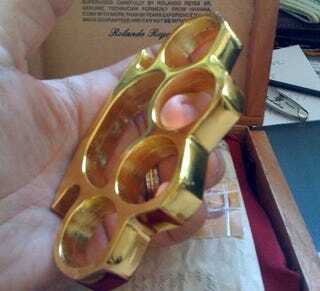 Brass knuckles or metallic knuckles are illegal in many of the states that they were shipped to. They're also illegal in California, where EA is based. In Colorado, possessing an illegal weapon is a class 1 misdemeanor, according to a Denver police spokeswoman. Illegal weapons are defined as a blackjack, gas gun, metallic knuckles, gravity knife, or switchblade knife. Electronic Arts did not respond to emails seeking comment about the legality of the items they shipped and whether they faced any legal actions for shipping them across state lines. UPDATE: After a little research we found that according to California Penal Code even shipping brass knuckles may be illegal. Manufactures or causes to be manufactured, imports into the state, keeps for sale, or offers or exposes for sale, or who gives , lends, or possesses any cane gun or wallet gun, any undetectable firearm, any firearm which is not immediately recognizable as a firearm, any camouflaging firearm container, any ammunition which contains or consists of any flechette dart, any bullet containing or carrying an explosive agent, any ballistic knife, any multiburst trigger activator, any nunchaku, any short-barreled shotgun, any short-barreled rifle, any metal knuckles, any belt buckle knife, any leaded cane, any zip gun, any shuriken, any unconventional pistol, any lipstick case knife, any cane sword, any shobi-zue, any air gauge knife, any writing pen knife, any metal military practice handgrenade or metal replica handgrenade, or any instrument or weapon of the kind commonly known as a blackjack, slungshot, billy, sandclub, sap, or sandbag. The law is punishable by a imprisonment in a county jail not exceeding one year or in state prison. We've contacted EA for comment and will update when and if they get back to us. Thanks to Jesse Ma for additional research for this article.